Sarah Duncan grew up with views over Dartmoor, igniting her love of landscape and the interplay of light and colour. She began painting at an early age and went on to study textiles at the West Surrey Institute of Art and Design in Farnham. After a period working as a set decorator on feature films in the UK and abroad, she has now returned to the West Country and to painting. In both her travels and her work, Sarah is particularly drawn to the coast with its rich light and sea-worn colours and textures. Her paintings start with the spontaneity and happenstance of monoprint, overlaid with the flat opacity of acrylics. They are attempts to capture particular moments of light. She is endlessly trying to capture moments of colour and light with sketchbooks and cameras, and these often form the basis of her paintings. Subjects vary from plants grown in her Bristol garden to everyday objects, seascapes and coastal landscapes, and she is particularly drawn to the juxtaposition of manmade objects in natural settings- a lone boat in the sea or cottage on the moors. 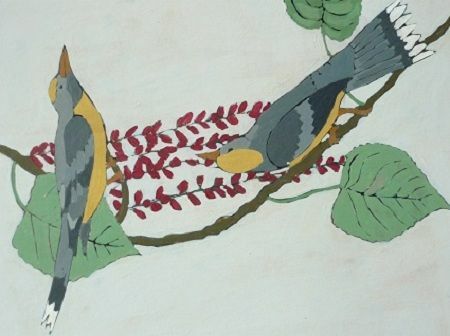 After a recent adventure to New Zealand with her family, Sarah has now been inspired to paint birds.